This past fall, my good friend, Louisa, did some AMAZING family photos for us! I am so blessed to have friends with so much talent! I've been having a lot of fun creating scrapbook pages to compliment our beautiful photos. The photos were taken in "The Bunkhouse" which was the homestead of my husband's great-great-grandparents. Our son, Mason, is the 6th generation. I love that I married into a family with so much history! I'll have to do a scrapbook to capture some of that history. Someday. This page features many of the Sale-a-bration goodies that can be ordered FREE from the Sale-a-bration catalogue with a $60 (Canadian) order. To make an online order go to my Online Store. Now, this is an amazing job! 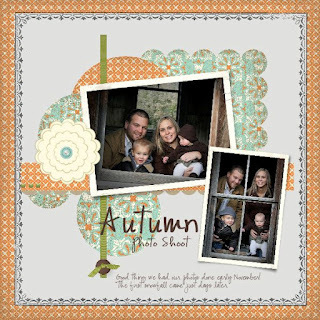 I love the colours and, of course, the beautiful photos of a beautiful family!